Ivan Boothe has written an excellent post on the Fellowship of Reconciliation website. 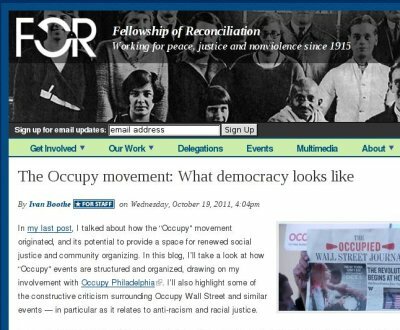 He talks about the cornerstones of the process used by the growing occupy movement in the States such as the people’s mic, consensus decision-making, and general assemblies – useful stuff about the purpose and problems associated with them, including some insights for facilitators and organisers. An unfamiliar process combined with poor facilitation, poor communication, and the inevitable rush of activist planning leads to a unaware but pervasive racism and classism that makes the setup feel far more oppressive than majoritarian voting systems with which people are familiar. I guess that applies to bloggers too! < Facilitating occupation	> Occupy: Learning from Climate Camp?